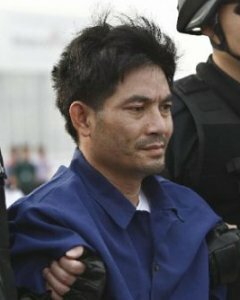 Today in Kunming, China, Burmese drug lord Naw Kham was executed by lethal injection along with three of his associates. Naw Kham (or Nor Kham), a Burmese Shan, ran a sizable gang of drug traffickers/paramilitaries/pirates, the Hawngleuk Militia, in the Golden Triangle. In addition to heroin smuggling, this gang also shook down for protection money the many Chinese commercial shippers coming down the Mekong River, and wantonly raided shippers that held out on them. He was untouchable in his lawless zone (with the possible protection of Burmese military to boot) for more than a decade. China’s economic boom has driven more shipping, and a search for investment outlets for Chinese capital, both inevitably increasing its presence on the economically developing Mekong. Ultimately this had to come at Naw Kham’s expense. 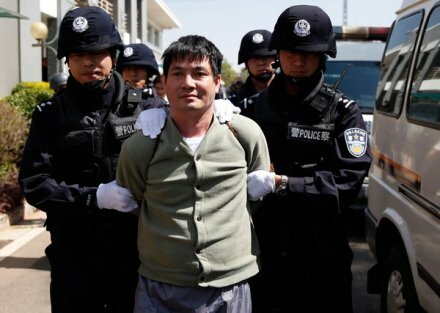 At any rate, China put the screws to the drug lord, not only pressuring Southeast Asian governments for his capture but directly hunting him with special forces. Early in 2012, Naw Kham was arrested and his gang broken up after a multinational manhunt; the leader was extradited from Laos to face Chinese justice with five of his associates. ** The accused had little recourse but to throw themselves on the mercy of the court. Executed with Naw Kham — and underscoring the multinational complexion of his outfit — were Hsang Kham (a Thai), Zha Xika (a Lao), and Yi Lai (stateless). The other two defendants received a suspended (reprieved) death sentence, and an eight-year prison term. Naw Kham being led to an execution van on March 1, 2013. Two hours of footage of the “Mekong River murderers” walking their green mile was broadcast on CCTV News, although not the executions themselves. The case isn’t entirely closed with his date’s executions, however. China is still pressuring Thailand to bring to book Thai troops whom China says colluded (at the very least) in the Mekong murders. The future direction of that investigation is quite unclear. * China, Burma, Thailand, and Laos, inked a 2001 pact to regularize shipping on the Mekong. It contained no provision allowing for stateless narco-buccaneers. ** It’s noteworthy that this is a non-Chinese citizen being extradited to China for a crime not on Chinese soil.